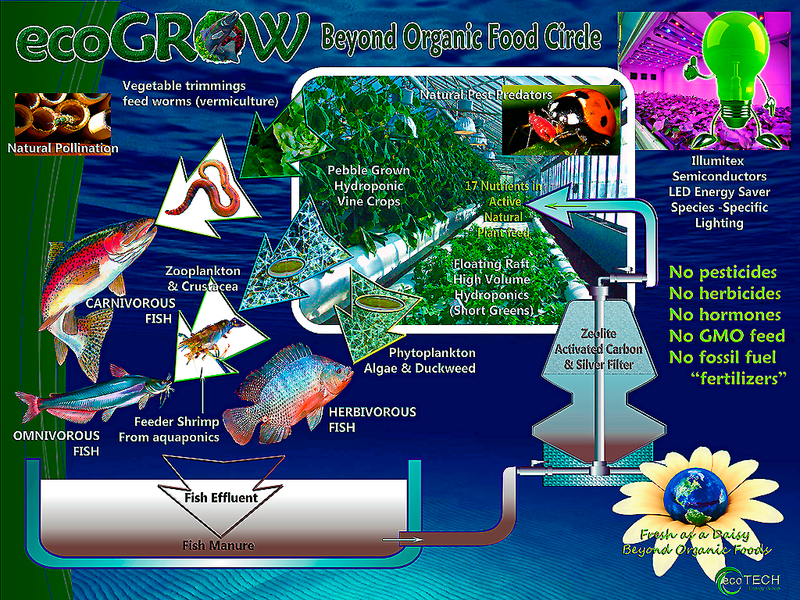 The ecoGROW full integration Aquaponics System is sustainable because it follows natural cycles and rythms in controlled environment facilities. We study the growth, feeding and habitat of each species of plant, aquatic animal, microbe, fungus, natural pest predator, pollinator and worm that form the symbioses of our indoor bio-zones, creating separate microclimates in each separated section of the complex. Some are wall separated to preserve species specific ambients and some are divided by air curtains, depending on the degree of separation required. Grouping and mutuality are carefully planned, as are isolation procedures and barriers that could be deployed if necessary. Constant monitoring for the health of each component or participant in the complex is essential. As this is an interdependent food production facility, every section must do its part to contribute optimum results with the emphasis on food safety the foremost criteria. We always know exactly what is in our produce.